How Not to Be Banned by Google? Google is the best source for traffic to your website and if your site is banned by Google, You will lose that source. Sites which are banned by Google may not appear in search result pages. There are many reasons for which Google ban websites. The sites which caught violating any of the rules of Google, get banned by Google. Rani Dababneh has explained it well in his post – Penalized by Google is worst than being Dumped by your Girlfriend!. Read his post and you will also realise that Google and Girlfriends are almost common. He has also explained some points that you must follow for not being banned by Google. Link : Penalized by Google is worst than being Dumped by your Girlfriend! It happens many times when you try to open a website but it keeps on loading. Even refreshing the page doesn’t help. In most of the cases it happens when a website goes down but some times it happens due to a problem in your ISP (Internet Service Provider). Here is an online tool which tells whether the particular website is down for everyone or its just. 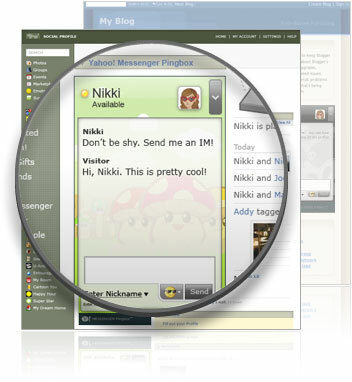 New Yahoo Messenger 9 is launched with new feature called Pingbox. With Pingbox, you can chat privately with your visitors. It is like Google Talk Badge but with some differences. Drives are not opening by double click. What to do ? If it happens to you that you are not able to open the drives by double-click, then your system may be infected with virus. When this virus infects your windows, it automatically creates a autorun.inf in the root directory of each drive. This autorun.inf file is usually hidden, read only and is a system file. This virus also disables folder option. This is not a major problem and can be fixed by deleting autorun.inf file. Open Start > Run. Now type cmd and press enter. Command prompt window will open. Now type d: and press enter for d: drive partition and repeat steps 3 and 4. Repeat step 5 for all your hard disk drives. Yesterday I came across a site that offers 1 TB (Terabyte) of free online storage. 1 TB is a huge amount of space and you don’t need to pay for it. You can host your files there and do lots more. Video DownloadHelper is a add-on for Mozilla Firefox. It helps in downloading videos from YouTube like sites. Now you don’t need to download any software or visit certain websites to download YouTube videos. You can download it very easily with the help of this add-on. Mozilla Firefox is the best web browser till now and its favorite browser of most of the internet users. Even recently launched Google Chrome can not replace it although Google Chrome has some good features. You can get more out of your Firefox now by transforming Firefox into Google Chrome by using addons. This way you will get the feel of both the browsers. Have you ever heard of making money by just watching videos ? Yes, you can now earn while watching videos. Till now you used to make money by joining survey sites, by viewing ads and some other ways that are hard to use, but its the easiest way. When i heard about this site, I thought of sharing it with my blog readers.